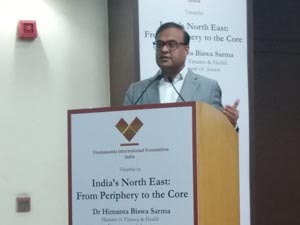 As a part of Vivekananda International Foundatio’s (VIF) longest running series of lectures, Vimarsha, Dr Himanta Biswa Sarma, Minister of Finance and Health, Government of Assam, was invited to deliberate upon India’s strategically important North-East, both from national and regional perspectives. The topic under discussion ‘India’s North-East: From Periphery to the Core’ was highly pertinent, especially keeping in view the newly introduced Citizenship (Amendment) Bill that has euphemistically put the North-East’s politics on a roller-coaster. Dr Arvind Gupta, Director, VIF, began the session with an opening remarks that highlighted, among other issues, the region’s diversity conjoined with its contiguity with a number of neighbouring countries, have brought the region much turbulence in the past - insurgencies, terrorism, ethnic violence, among others. The region is also wracked with illegal migration and other related problems. Dr Gupta however stated that the North-East region needs to be approached from a wider regional perspective, especially from a viewpoint that it acts a gateway for India’s connectivity with the South-East Asia. Dr Gupta then invited Dr Himanta Biswa Sarma to enlighten the audience on how the North-east region is moving from core to periphery. Dr Himanta Biswa Sarma, the guest-speaker, stated at the outset that North-East region has a lot of complexities. He explained how the North-East, which lay at India’s core prior to partition was pushed to the periphery due to the Centre’s sustained neglect and apathy over a long period of independent India’s past. He further pointed out how the current government was bringing the north-east region back to the core yet again. Dr Sarma then gave a brief historical overview of the North-East region and pointed out how there were exhaustive trade relations in 13th and 14th century with South and South-East. As the trauma of partition took the country almost a quarter of a century backwards, Dr Sarma pointed out, that Nehru almost turned a blind eye to the North-East; as a result development was sluggish. Dr Sarma stated that not just in economic sphere the north east received scant attention but in all other critical spheres like centre-state relations, refugee crisis, control over the resources, illegal immigration, and internal and external security issues, the region faced internal colonization from its own government. Dr Sarma pointed out that the journey from periphery to the core was an arduous one. He commended the current government saying the last four and half years have been the best years for the North-Eastern region. He further emphasized that it is during the last four and half years that the entire North-East region has moved from the periphery to the core of national development agenda. Under the ‘Act East ‘policy, the prime minister has raised new hopes among the people of the region who have otherwise always suffered due to step-motherly treatment meted out by various successive governments. Dr Sarma emphasized that with the success of ‘Act East’ policy Guwahati will become the centre of the region. Dr Sarma highlighted three recent important steps taken by Prime Minister Modi to preserve Assam’s identity and demography: the proposed amendment to the Citizenship Act, and other two to preserve the demography and culture of Assam that includes constitutional status to the Clause 6 and a bill to give tribal status to six communities of Assam. He also thanked the Prime Minister for transforming the socio-economic status of the entire North-East region and improving the much needed infrastructure. Dr Sarma stated how a pragmatic policy ushered in by Prime Minister Modi, i.e., transformation through transportation, is altering the North-East through connectivity revolution. In his concluding remarks, Dr Sarma said that the North-East was no longer at the periphery but in every policy matrix, it was in the core. He emphasised that it was the best time for the North-East since independence, and stated further that we need to establish strong nationalist mind-sets to work for development. During the interactive session, Dr Sarma responded to wide range of questions over the Citizenship (Amendment) Bill and other related issues.